I like to keep busy in case you haven't noticed. But December felt pretty crazy with all the events I had scheduled. Here are just a few of the big events that I was a part of. Included are a few upcoming events as well. This was my first time going to the festival since I was in grade school I think. The place was huge and I didn't get to see everything before they were closing up for the evening. But my buddy, Braden, and I got to see plenty. I had been to the Christmas concert only once before and quite enjoyed it. Of course it was the with David Archuleta so what was not to like. I was unprepared to enjoy this year's concert so much. The guest star this year was Tony Award-winning tenor, Alfie Boe, who also starred as Jean Valjean at the Les Misérables. The guest narrator was Peabody Award-winning news journalist, Tom Brokaw, who told the story of the "Candy Bomber." The whole experience definitely touched my heart. It was a fun evening with Braden, Ty, Bryant, Tennille, and Emily. 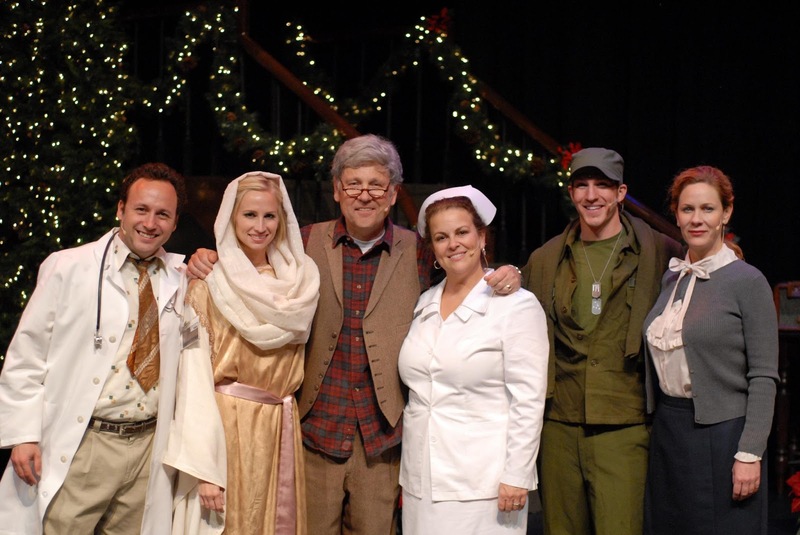 I attended Michael McClean's The Forgotten Carols almost 20 years ago for the first time. I had forgotten the story but remembered much of the music since my parents had given us all a CD from the production. I went with my friends Braden, Ty, and Bryant. To be honest, again, I was really surprised that I enjoyed it as much as I did. Sure it was a bit cheesy but the messages were still touching. Thanks to my friend, Ty, I actually got a little high culture in too. 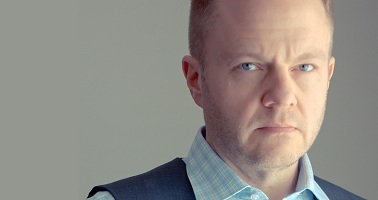 The symphony has a series where Broadway stars come and perform with them. This was their holiday version. I had seen them once before up at Deer Valley (which is a pretty awesome setting.) This time the Broadway stars were tenor, Doug LaBrecque, who was in Phanton of the Opera and mezzo soprano, LaKisha Jones, who was in Oprah's The Color Purple and a former contestant on American Idol. It was fun evening other than the vertigo I had worrying about falling from or dropping things from the 3rd balcony! :) Afterwards Ty, Braden, and myself joined Ty's parents who also attended for a hug sundae at Leatherby's. The family Christmas party is always a good time. We were able to get almost the whole family together. 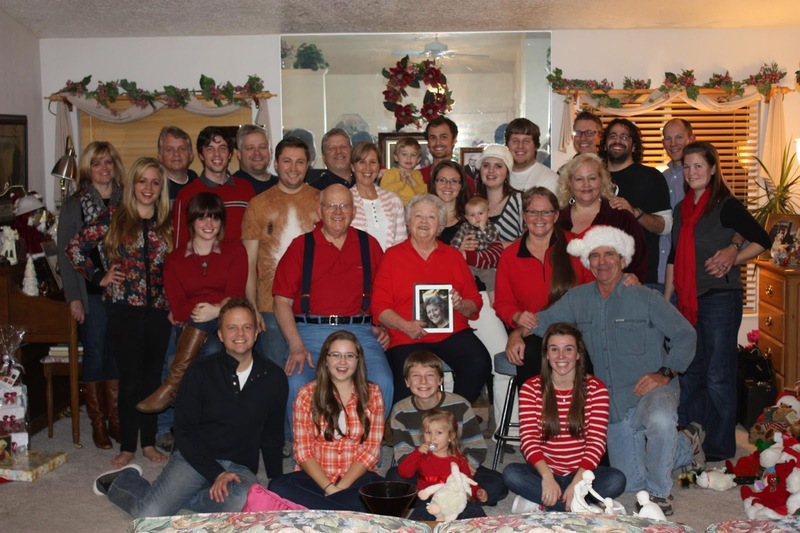 We were just missing my sister in Arizona and her husband and then three great-grand-daughters. We had delicious food as always. I made two appetizers shown below. 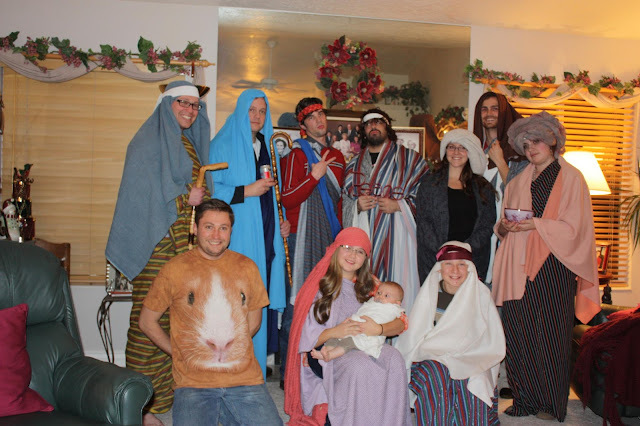 We did our usual nativity. This year I was not Buddy the Elf or Big Hairy Baby Jesus. I was the shepherd bringing the gift of Diet Coke. At least we had a really cute baby Jesus! No Borup family Christmas party would be complete without a white elephant gift exchange. 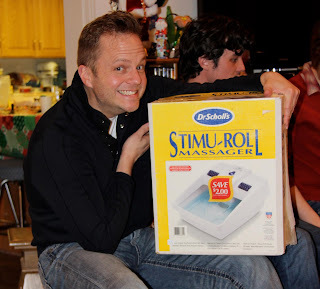 This year I scored a sweet Stimu-roll foot massager that someone apparently picked up at Deseret Industries for only $5! You can see my excitement. This year I brought Miss Jennie (Suzie's friend) with her Angry Birds hat, a camouflage Snuggie, and some glow bracelets. Someone scored big time! 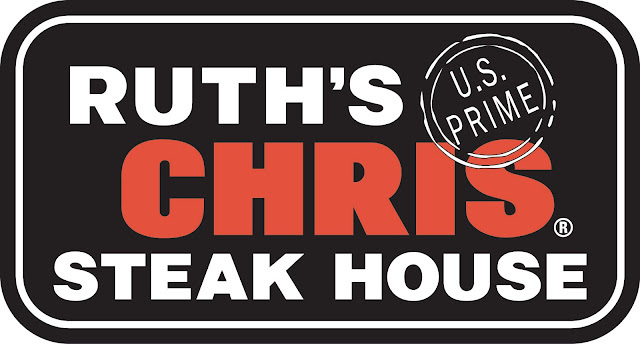 It's become a tradition at my company that we celebrate the holidays at Ruth's Chris Steak House. At least its been a tradition since they've opened a restaurant in Utah. It hasn't happened yet but it's time for it this weekend. This year I'm taking my friend Andrea. Hope she's ready for a big yummy steak! My company is always super generous at Christmastime. 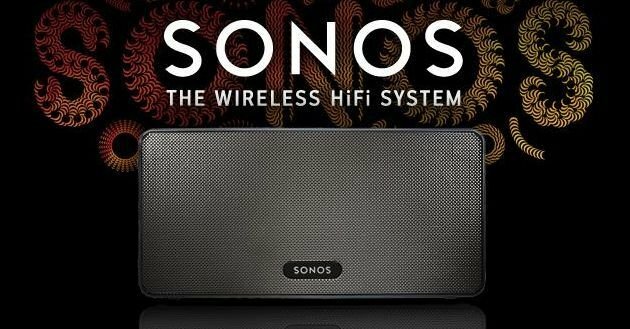 This year they gave me an Sonos Play 3 and bridge. It's a wireless media player. I haven't got hooked up yet but I'm excited to do that! Thanks guys! This New Year's Eve will begin with some entertainment from one of my favorites, Kristin Chenoweth. She generally best known for playing Glinda in Wicked on Broadway. But I've also loved her on the TV shows Pushing Daisies and GCB which are both off the air now. I'm sure it will be amazing!